Row House Old Town is the newest boutique fitness trend to hit the streets of Chicago! Row House was started in New York in 2014 and has since exploded on the East and West coasts. Reviews show that people love this low impact, high results, workout and are filling studios across America. Row House Old Town opened two weeks ago and several of its classes are already booked to capacity. Chicago Athlete visited the new facility located at 1226 N. Wells Street to find out what the buzz was about. The format of Row House classes is simple; it’s a 45-minute, full body workout, where participants move from the erg (the rowing machine) to the floor multiple times throughout the class. Each class has a different percentage of time spent on the erg versus the floor, but they all incorporate both components in the format. Classes at the Old Town location include: Stroke, Body, Full Row, House, Power, Launch, and Restore. Each class is offered multiple times throughout the week and at different times of the day. 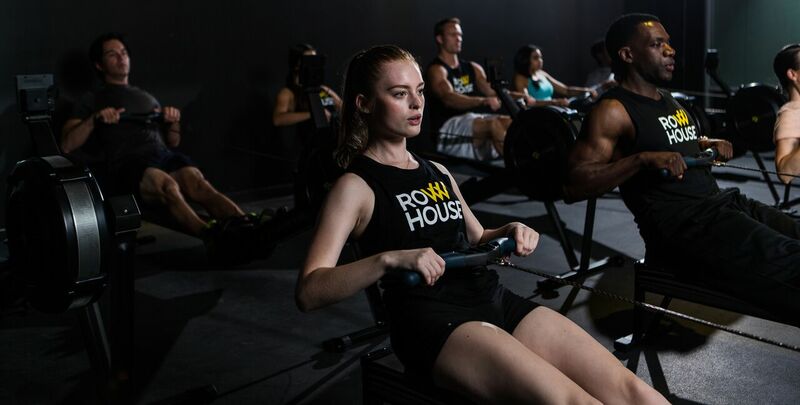 Row House uses technology to make it easy to book a class, sign up for memberships, review your class performance, and even reserve a specific erg. I chose a Power class which was offered during the lunch hour on Friday afternoon. After booking my 12:15 p.m. class, I immediately received a confirmation email advising me to arrive 15 minutes early to set up my erg. I easily found the Wells Street studio with its modern, chic look and bright inviting atmosphere. The staff immediately made me feel welcome showing me where to store my items (in free lockers) and where to check in electronically. I noticed instantly the warmth and comradery of the staff and fellow participants, who helped me to adjust the settings of the erg so that I was in proper rowing position. I was then given a crash course on the correct form for rowing and off we went. The room filled and the class began as the instructor cheerfully instructed us to begin and repeated several times throughout the course that “everyone pulled together” and “every seat counts.” The lighting changed throughout the class as the high energy music kept everyone engaged. The Power course spent 60 percent of the time on the rower and 40 percent on the floor. We began on the ergs and I found the movement as a whole to be exhilarating; everyone in the room was rowing back and forth with the same timing and motion, while the instructor advised what the monitors on our ergs should display for speed. The Row House concept is one built on comradery and support, with the words “Pull Together” displayed on the wall of the studio. The instructor mentioned several times about the importance of staying together in our movement and the display screens at the front of the classroom showed the class average, instead of each individual performance. For example, during a sprint round of training, the instructor encouraged the class to lower our average split time by 15 seconds. As we began the higher intensity, it was fun to watch the split time lower at the efforts of the whole. After the first 10 minutes on the rower, we moved to the floor where we did body strength training such as lunges and push up’s before moving back to the erg. We transferred from the erg to the floor several times throughout the class and I was shocked when the instructor informed us we had just minutes left in our Power class. I left a believer in Row House. The class was fun and moved quickly with all of the variation throughout the class. It was a supportive atmosphere where we could enjoy success in our performance as a whole. And, the use of technology was at the forefront of the industry. Upon leaving, all participants were emailed a workout summary with class and individual statistics. Row House Old Town has a variety of memberships including: four classes per month, eight classes per month, or an unlimited package. You can also purchase single drop in classes to try it out. Chicago should expect to see Row Houses opening up throughout the city and suburbs, as they plan to expand to a total of ten locations.